Home to Eskom’s Kusile Power Station, the Mpumalanga coal-mining town of eMalahleni (formerly known as Witbank) continues to experience a strong demand for housing, says Elisme Swart, area principal for Pam Golding Properties. 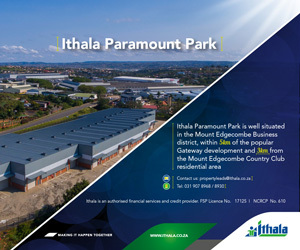 Emalahleni’s only regional shopping centre, Highveld Mall, set to launch phase 3 on 25 October 2012, will offer customers even more of what they enjoy. A buoyant retail property market helped listed property loan stock company Resilient Property Income Fund's distribution growth soar 19,87% to 63,20c for the year to December. Listed property loan stock Resilient Property Income Fund said yesterday that it would own a 60% interest in a new R450m shopping centre in Witbank.